surpassed $1 trillion (1,087 trillion KRW). 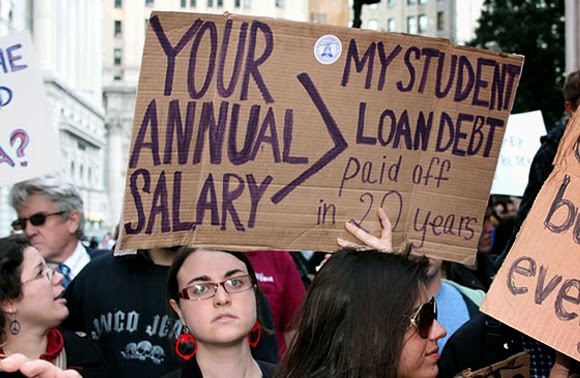 students in the United States owe student loan debt. (about 543 million KRW) by student loan debt. This is 2 times more than a decade ago. the average student debt for one person is about $25,000 (about 27.17 million KRW). fallen into $50,000 (approximately 54.35 million KRW) of student loan debt. who’s a teacher of a junior high school in Maryland. but she only earned $13,000 (about 46.74 million KRW) last year. serving as a church choir as increased income. Betty is currently working as a waitress in a restaurant in the evening. burning student loan documents, holding a sign 'degree without debts’. if they declare for personal bankruptcy in the United States.